Britain's Elise Christie won silver in the 500m at the final speed skating World Cup of the season in Italy. The 28-year-old Scot was beaten by Italy's Martina Valcepina, who won both 500m competitions at the event in Turin. On Saturday, Christie missed out in the 1500m and was also part of a mixed relay team disqualified from their semi-final. The World Short Track Championships take place in Bulgaria next month. Christie sustained damaged ankle ligaments at last year's Winter Olympics in which she fell in the 500m final and 1500m semi-finals and was disqualified from the 1,000m heats. She returned from injury in November, finishing third in a heat with the mixed relay team at the opening World Cup event of the season. 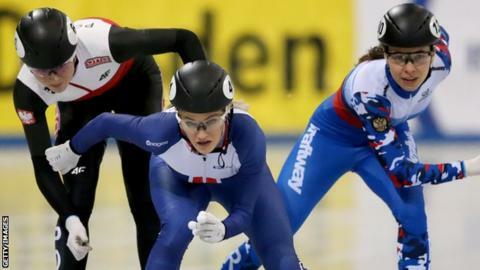 Last month Christie won 1500m silver on her solo racing comeback at the European Short Track Championships in the Netherlands, adding bronze in the 1,000m the following day. Last week she was part of the mixed relay team that won bronze at the World Cup meeting in Dresden. "Since the Olympic Games it's been quite challenging for me," she said. "I've had a new coach, I had some time out over the summer, and have only been able to train properly these last few months. "Since the Europeans, I feel like I've been building some positive momentum and I'm really excited about the next three years."